The luxurious 5 * hotel Lor-In is a stylish oasis surrounded by beautiful "lagoons", exotic gardens with impressive large statues, and rice fields. The hotel also has an exceptionally nice swimming pool. 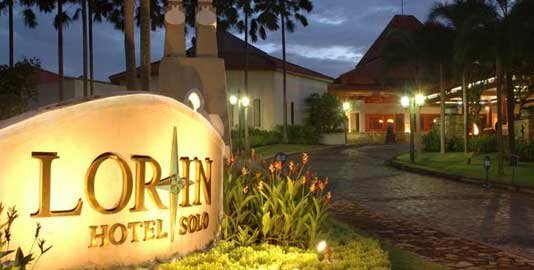 Lor-In is located between Adi Sumarno Airport and the city of Solo. The business district and the main shopping centres are about a 10-minute drive from the hotel. There is a shuttle service to the city. The spacious, clean rooms decorated in warm tones have a view of the garden. All rooms have AC, telephone, satellite TV, own movie system, minibar, kettle, bathroom, bathrobes and slippers, hairdryer, wifi and balcony or terrace. Swimming pool, children's pool, several restaurants (Indonesian and Western cuisine, fish restaurant, extensive breakfast buffet), pool bar, Jacuzzi, Spa, sauna, massage, gym, tennis court, beach volley, shop, lockers, room service, laundry service and business centre.